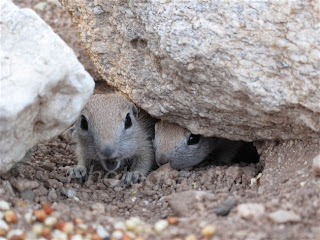 These little guys, Antelope Squirrels, are new babies, fresh from the nest. They've been romping in the back yard (not of my house, though it would be fun watching the dogs go crazy) for the past few days; learning the layout, the easiest escape routes, and just how close they can get to the sliding door before the cat launches herself at the glass. The sudden 'clunk' usually freaks them out just a bit.